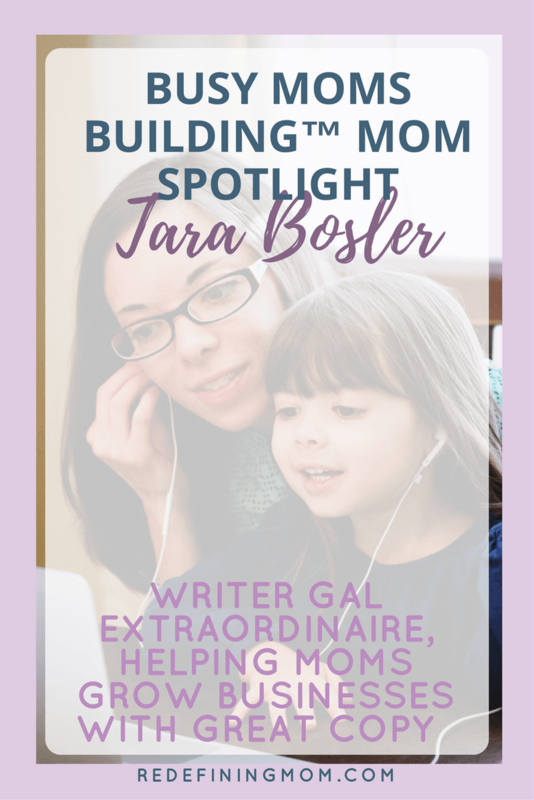 This week’s Busy Moms Building mom spotlight is Tara Bosler of TBoslerWriting. 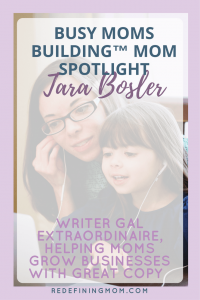 Tara Bosler is a copywriting queen and your Writer Gal Extraordinaire! She loves to help women GROW their businesses through engaging and authentic copy that doesn’t sound like a template! She is a single mom living in the Philly area with her 4-year-old daughter and nervous dog. Why did you decide to build your own business? Less than a year ago, I was let go from my teaching job of eight years. I taught communication and women’s studies classes at the college level at the university where I earned my master’s degree in communication studies. I was dedicated. I was a favorite among the students. I gave of my passion and my time way outside of my job description. But at the end of the day, I didn’t have a PhD…the piece of paper they ultimately decided I should have in order to keep my job. When I found out this news, I had also just broken off an engagement, moved, and had become a single mom again. So, needless to say, there was a lot of crying for a couple days. And I let myself cry. And then I picked myself up out of the puddle of tears and assessed my options. I could find another teaching job, though a full-time one without a PhD is tough to find and pays next to nothing. Or, I could turn my side hustle freelance writing gig into a full-time, full-fledged business. So during my last teaching semester, that’s what I did in every single spare moment I had. I would go into my office early and work on my business before classes started, in between classes, and after classes were over. Heck, DURING class when I had guest speakers in! I, literally, took every single spare moment I had to make this work. I made connections, wrote for free, bartered, created collaborations, went on podcasts before I had much of a clue what to even say on a podcast. I stepped out in faith in a big way, and success was returned to me. I stepped out in faith in a big way, and success was returned to me. What does your typical daily schedule look like? Wake up every day at 5:30 am so I can have at least an hour to myself. I have three dedicated work days a week for my business, which means I have to maximize all of that time. Mornings are for writing my own content and doing client work. Afternoons are for client calls, podcasts, Facebook lives, guest expert spots, etc. On days when my daughter is home, I often work during nap time. But I try to spend dedicated time with her because that’s what this whole thing is about! 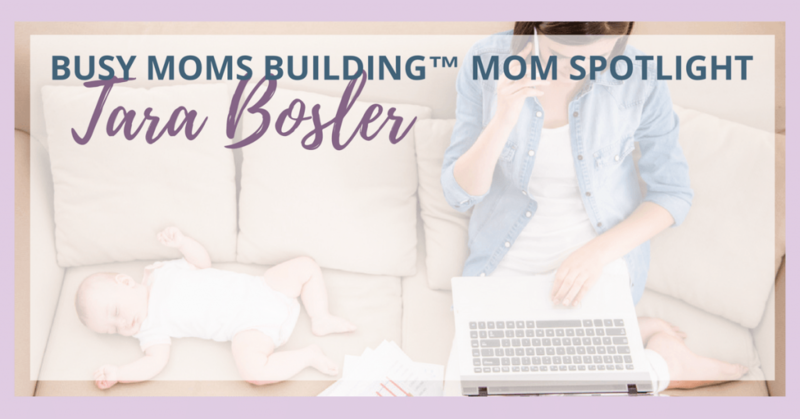 What is the biggest obstacle you face when it comes to being a working mom running her own business? My biggest obstacle is usually myself, honestly. I am continually working through mindset blocks with every level I try to bust through. So, I just have to get out of my own freakin’ way. Give us your best time management tip! Get up early and make time for rest. Constant work leads to burn out, which doesn’t sustain energy and productivity. What motivates you in your business? 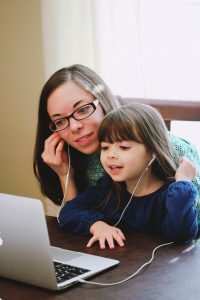 God, my daughter, and the Profit Party Podcast. Tell us where we can find you and support you in your business journey! You can find me on my site and get a Copy Writing Playbook. And you can also join our Micro-Group Intensive this month.